There are many software packages available to draw floor plans but if you don’t want to use one (or like me don’t want to use one all the time) then this page tells you about how the professionals play around with floor plans with pencil and paper. The first thing to do is decide on the scale and what units to work in. Take a look at the surface you’re going to be drawing on (or printing onto if you’re using software) and work out an appropriate scale. Most professionals will work on large pieces of paper like ledger tabloid or above. As enthusiastic amateurs letter size is always available (or A4 if you’re in Europe). For these smaller sizes of paper a scale of 1/8 inch to a foot 1:96 (1/8"=1'0") is a good scale to go for or if you’re working in metric 1:100 works well. 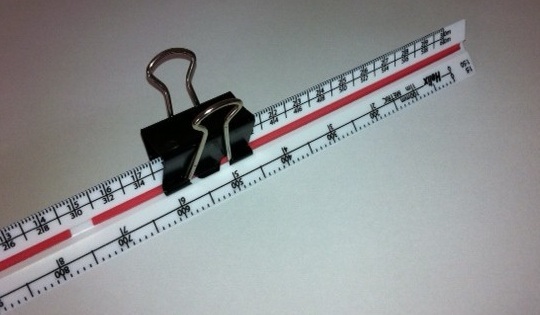 This means that 1cm represents 1m or 1mm represents 10cm. 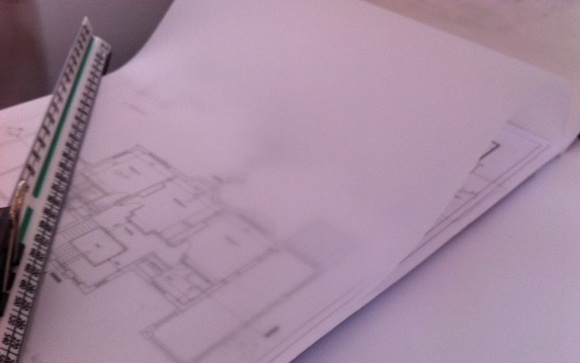 Graph paper, tracing paper and an architects’ scale are really useful tools. Architects scales are a triangle shape. I use a clip on top so that it's easy for me to find the side I'm using because I know which side of the ruler should be up. Before you start make sure that the longest dimension of the home will fit on the paper. This matters a little less if you’re using software because the program will scale your drawing to fit. Start by drawing the exterior walls of the house. It can help to start with a basic outline of the house – say a basic rectangle and then add on to this any bump outs. If you’ve got internal measurements rather than external ones figure out what the wall thickness is. This will vary depending on the construction method of the walls. Interior walls are usually about 41/2 inches thick and exterior walls around 61/2 inches. If you’re about to draw floor plans for an existing home measure the thickness of the walls at the doors and/or windows. Next we move inside. It makes sense to start on the main floor. At this stage you want to add in the only the bones of the house. That is any walls that you think are going to be load bearing. If you’re designing or modifying a house plan or remodeling only draw in the walls that you know you’re going to keep. Once you've got your bones done you're finished on this piece of paper. So this is the secret of the professionals. Get your home bones sheet and put tracing paper over the top. You can use a tracing paper roll or a tracing paper book. The pros use a roll but I like a book because the seam of the book helps to keep the page in place. The you can just trace over the top of the bones and work on the rest of the spaces in the floor plan. Fill in the remaining interior spaces. It works best if you start with the largest spaces and work down to the smaller spaces. Add in the layout for your kitchen and bathroom. I have a page about how to draw floor plan symbols which covers everything you'll need for this. If it hasn't come naturally to put in doors and windows as you do put them in how. Here's the pages available on paper based home design tools.